Procrastination is a problem for many of us. No matter how much we promise ourselves that we’ll stop wasting time and will focus on the more important things in life, we still end up wasting a lot of time. The difference between procrastinators and achievers is nothing more than willpower and determination. When you have the right mindset and focus, you can achieve almost anything. But often times people are quick to plan and make promises to themselves but are slow to execute. 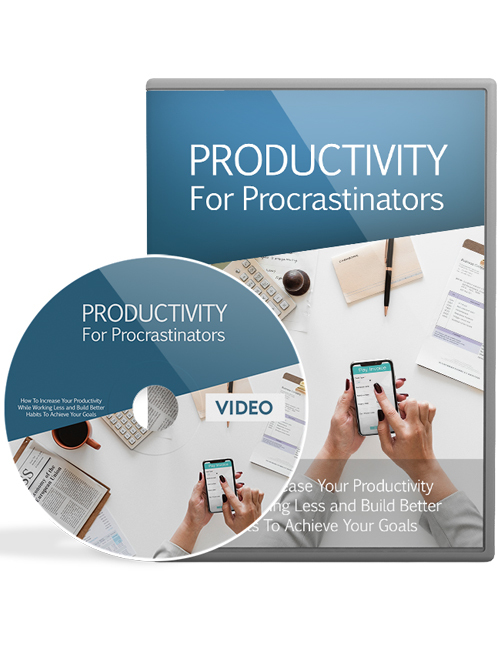 In this video course which complements the Productivity For Procrastinators ebook, you will discover how to increase your productivity levels and develop better habits and ultimately achieve a happier and more fulfilling life. Everyone should have goals in life and aspire to be the best version of themselves. When you are determined to make a positive change in any endeavor, you need to put forth the effort. That means being more productive and getting things done. In these videos, you will learn the essentials in improving your productivity, using technology to assist in your productivity plan, working less and achieving more, putting in a diligent effort to reach your goals without overworking and much more. Rather than promising yourself about what you hope to accomplish, use this course to motivate yourself and make a real push. You owe it to yourself. Hit the download button now.